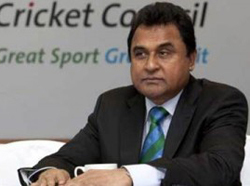 Dhaka, Apr 1, 2015 (PTI): Left fuming after he was denied the honour of handing over the World Cup winners' trophy, Mustafa Kamal today resigned as ICC President and launched a scathing attack on the world cricket body's Chairman N Srinivasan, calling him "rotten". "I am just sending my resignation to the ICC...I was not allowed to work in line with the ICC constitution and I cannot work with them beyond the ICC constitution," he told a crowded press conference at the Hazrat Shahjalal International Airport here today. Kamal was livid at not being given the opportunity to hand out the World Cup trophy to champions Australia and had left the Melbourne Cricket Ground even before the final finished. Instead, Srinivasan handed over the trophy to Australian skipper Michael Clarke. The Bangladesh Cricket Board President today launched an extraordinary attack on Srinivasan after returning to the country. Calling him "rotten and controversial", Kamal said the ICC could well now be called the "Indian Cricket Council". "I feel bad even to mention his name. If that man is in charge of cricket, how will cricket run?" Kamal said. "These type of people should be away from cricket, these kind of people are polluting the game. Otherwise cricket will be spoilt. It is my earnest request to the ICC to revisit these things and people should research why I have resigned," he added. Kamal was reportedly denied the honours after he blamed poor umpiring for Bangladesh's comprehensive loss to India in the quarterfinals. The ICC was forced to issue a statement to reject his charges. This reportedly infuriated Srinivasan, who wasn't amused after hearing Kamal's comments on record. While the former BCCI president didn't say anything in public, he did express his displeasure to the ICC board members and questioned as to how can Kamal pinpoint on one wrong umpiring decision and take it as an isolated case.Kamal claimed he was asked to withdraw his comments. "I will not withdraw the statement because it was the sentiment of 160 million people. Then they told me, if you can't submit an apology or withdraw the statement, you can't present the trophy," he said. According to an amendment in the memorandum and articles of association of the ICC which was unanimously approved by Full Council in January 2015, it appeared that the job of handing over of trophies at global events rests on the ICC president. According to clause 3.3 (B): "With effect from the 2014 Conference Close Date, the President shall act solely as chairman at Conference and Special Meetings and be responsible for presenting trophies at global competitions and cricket events held under the aegis of the Council. For the avoidance of doubt, with effect from the 2014 Conference Close Date, the President will no longer act as chairman of the Executive Board or as chairman of any Committee or Sub-Committee." The ICC President is, however, the ceremonial head while executive powers lie with the chairman. However, till 1996, the World Cup has been handed by various people and not necessarily the head of ICC. "The main reason for my resignation is that I can't work with those who can act unconstitutionally and unlawfully," he said. Kamal had made a stinging criticism about "umpiring bias" during Bangladesh's loss to India. In that match, India's Rohit Sharma was not given out to a Rubel Hossain delivery which apparently looked a "touch and go" decision. He insisted that he had not spoken against any country but said he was denied the opportunity of presenting the World Cup trophy for "speaking the truth". Kamal had come close to questioning the integrity of the umpires by saying that the ICC should investigate the matter and questioned whether some decisions were "deliberate or not." A day later, the ICC's chief executive, Dave Richardson, termed Kamal's criticism "unfortunate". On arriving back in the country today, Kamal addressed a dramatic press conference during which he asked the present journalists to suggest whether he should tender his resignation. "Yes, you should resign," answered one of the scribes to which Kamal replied, "OK, I am just going to do that." Kamal grow up. There no umpiring bias. They are neutral umpire. In cricket, umpire decision is final whether you like it or not. Ajinkya Rahane had a close decision which went against him. He looked shocked. But this is the difference between cultured guys and uncouth characters. Srinivasan may have allegations against him. Have they been proved beyond reasonable doubt? Sharad Pawar was snubbed by Ricky Ponting and co during champion's trophy few years ago. He actually pushed him aside and posed for group photo after winning the trophy. Pawar smiled from his good side of his face and looked miserable. Srinivasan was also snubbed by Aussies players apparently who refused to shake hands with him. The audience booed him when his name was announced. Kamaal can take comfort in that fact.